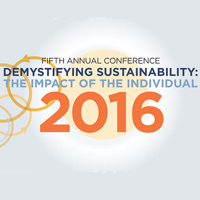 You are invited to Webster University’s Fifth Annual Sustainability Conference on Saturday, Oct. 8, 2016. The theme for this year’s conference, Demystifying Sustainability: the Impact of the Individual will be addressing the variety of ways the term “sustainability” has been adopted by different organizations, businesses and individuals throughout our community. Speakers, panelists and presentations will range from local restaurants exploring local and sustainable food sourcing, to the intersection of faith and the environment, to how artistic expressions can help create sustainable communities and many more. The event will take place at Webster University’s home campus in Webster Groves. Registration covers meals, breaks and conference materials. Interested in learning more? You can view our agenda and list of speakers online. You can also the visit the website to register, or by clicking the link below. Contact Kelsey Wingo, sustainability planner, at kelseywingo07@webster.edu for more information.